Le Fédération algérienne de football have revealed the adidas home and away kits that Algeria will wear at the 2019 Africa Cup of Nations and during the 2019/20 international soccer calendar. Les Fennecs new kits are in their usual home white and away green. The 2019/20 Algeria home jersey uses a new adidas rounded neck design. A sublimated dotted pattern adds detail to the front of the shirt. The green and red of the North African nation’s flag accent the shoulders, collar and sleeve cuffs. The Algeria AFCON 2019 away kit is a green version of adidas’ Campeon 19 template (in turn based on the Germany 1990 and 2018 World Cup home jerseys). It crewneck collar and sleeve cuffs are white with red trim. 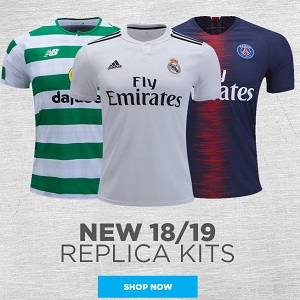 The Algeria 2019/20 adidas home and away kits are expected to be on sale at World Soccer Shop, UK Soccer Shop, Lovell Soccer, Pro:Direct Soccer, Subside Sports and Kitbag. Copyright © 2019 Football Fashion.